Funded by Kickstarter and developed by Tribute Games, Mercenary Kings: Reloaded Edition was released on February 6th, 2018 for the PlayStation Vita, Nintendo Switch, and Xbox One. It comes as a free update for those who have already purchased Mercenary Kings. Back when Mercenary Kings was first released in 2014 for PS4 and PC, I had a chance to play it on PS4 and I was really impressed with the game. I'm happy to report that playing the Reloaded Edition felt incredibly familiar. Getting into the weird world of Mercenary Kings: Reloaded, with its distinct art and character design (courtesy of Paul Robertson), is something I very much enjoyed. 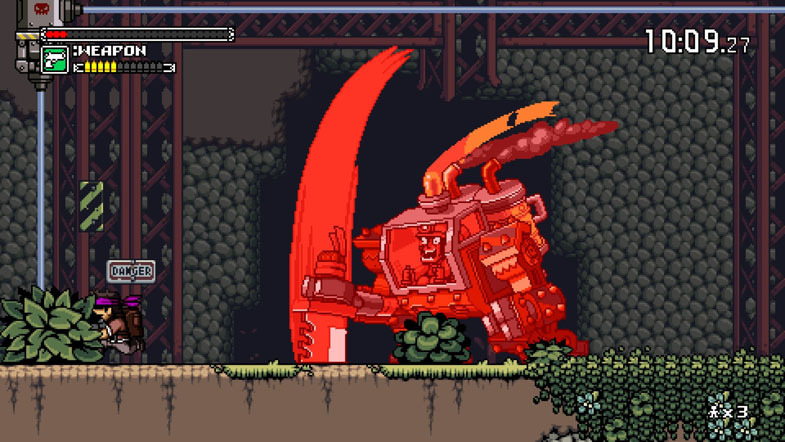 Mercenary Kings: Reloaded is a side-scrolling shoot-em-up in the style of classics like Metal Slug. Gameplay is split between the Mercenary Kings’ campsite and missions. At the campsite, you can interact with various NPCs, purchase and craft weapons or armor, change the color of your character, play online, and select missions. During missions, you have tasks to complete, which might include collecting a set number of items, rescuing prisoners of war, or taking out specific targets and then rendezvousing with fellow Mercenary Kings. Each mission is timed, pressuring you to finish the mission efficiently. You must navigate the area to find your objective, which is conveniently marked on the map. Gameplay is quite smooth. Running and jumping through the levels feels incredibly precise. The level layouts are suited to your character’s abilities, providing multiple routes to complete the mission objective. The variety of enemy types, with differing attack patterns, are mixed into the levels in clever ways. You can also use materials picked up from crates and enemies to craft a vast number of different guns and knives. Are you tired of using your pistol? Try making a machine gun with electric bullets. Are you finding your bullets are not traveling far enough? Add a scope to increase the range. Bullet spread too wide for your liking? Add a stock for extra stability. The number of combinations are extensive, allowing your preferred choice of loadout. You might recognize some of the available weapons, as many of them are direct references to anime and other video games. 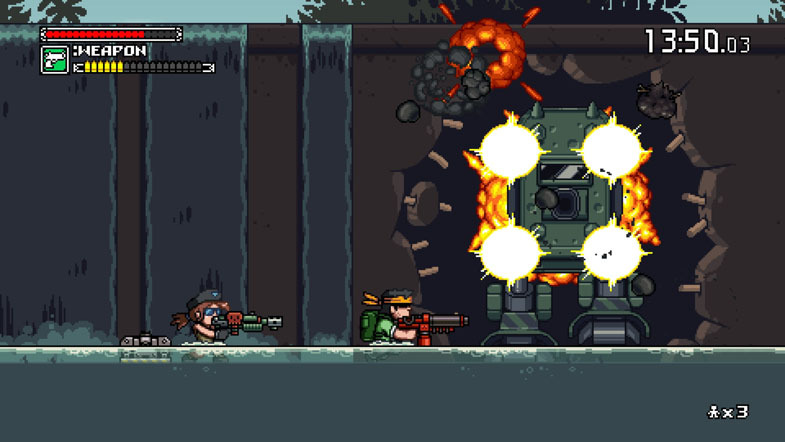 Mercenary Kings: Reloaded features a small number of very welcome updates to the base game. On top of two new player characters, there are also additional banners for your tent, new knives, guns, and a new Steel Soldier mission. The biggest game-changer, however, is the ability to buy materials at camp. You can purchase materials that you weren't awarded at the end of a mission, allowing more options for crafting. This is a welcome addition, as it was frustrating and time-consuming to have to grind missions for materials. The initial plot is fairly straightforward. You take on the role of the titular Mercenary Kings, the world’s most skilled warriors for hire. After you and your team lands on a mysterious island, the Kings are set upon by the evil forces of the CLAW army. It's up to you and your comrades to take them down. Snippets of the narrative are peppered in after missions are completed, giving many of the characters a shot of personality, but the story is primarily explanation for the various missions that the Kings take. Even so, the conversations are entertaining and the members of the Kings get a chance to shine with their various quirks and humorous puns. Despite the overt blood and gore on display during gameplay, the narrative is quite light-hearted. The pixel art style is also incredibly charming and expressive. A former scientist turned fighter Frigg, and the charming robot C-Zar, join veterans King and Empress as new player characters in the Reloaded Edition. Both characters are a welcome addition to the cast, having unique voice clips and animations that really accentuate their personalities. Accompanying the great visuals is a very catchy soundtrack. Composed by Patrice Bourgeault, it features great chiptune music that fits with the pixel art style. The music has an old school feel to it, reminiscent of classic Nintendo games. The Main Theme is a highlight as it sets an over-the-top tone for the whole game. The only downside to the soundtrack is that there is not a large variety of songs, so you will hear the same tunes quite often. Thanks to the mission-based structure of Mercenary Kings: Reloaded, it's quite easy to jump in, play a few missions, then jump out, making it perfect for short bursts of action. Extended play, on the other hand, tends to feel a little tedious because mission variety is fairly low early on. While the locations have a lot of personality, going back to areas with the same backdrop and music, time and time again, gets tiring. There are over one hundred missions, though. Thankfully, the repetitiveness is offset by the influx of loot, as the joy of experimenting with new guns and knives really helps keep things interesting. While the updates do not completely change the core experience, this is definitely a title worth revisiting. Nedu has been playing PC games since the early stages of 2013. Now he goes through withdrawal when he leaves his apartment. He primarily enjoys, RPG's, action games and the occasional rogue-like. He also plays MMO's. Far too many MMO's.